I have given many blogging tips over the years. One of the areas I haven’t spoken about in awhile is experienced vs. inexperienced advice. Let me clarify: there is a difference talking about what you think you know vs. speaking from experience. Yesterday I came across an article that was contradictory. This is a screenshot of the article and my initial thoughts while reading it. The author meant well, probably a great guy, but the article makes no sense and could really lead someone down the wrong path. My goal is to shed light on these types of issues so they can be discussed and avoided in the future. The article advises bloggers to evolve or not get stuck in a rut when it comes to blogging. In theory, that makes sense. However, there are blogs covering all types of topics and each niche or genre has different needs and requirements. Trying to give blanket advice for all niches is a slippery slope. Was this advice given by an experienced blogger (with a successful site) who successfully tried the advice or by a blogger who thinks this is good advice? Unfortunately, it was not clear if the writer was talking definitively about non-personal blogs until the end of the article. With personal blogs, evaluating the competition is not a wise move since there is only one “you” and who does “you” better than “you”, right? Let’s delve into the article a bit. Have you ever had a favorite TV show that changed writers and the show went downhill? Have you dated someone who changed, and you had less in common (grew apart)? If a blogger changes their tone or style of writing, how can readers “connect” with the writer? When someone likes your writing there is something about it that appeals to him or her. Perhaps it is the accurate information, the side humor, the style of writing, the laid-back tone, etc. If you change that, will the reader embrace the loss in traits that attracted the reader to the blog in the first place? Why does evolving require changing your tone or style? Wouldn’t a better route be adding features, setting a higher standard, doing something unique? To evolve (and survive) there has to be a solid foundation. If a technology blogger wanted to take things to the next level, they would not necessarily do the same thing a parenting blogger would do. One interesting phenomenon is the inability to learn from someone else’s past mistakes. There are many examples of bloggers that changed their tone and style, losing their audience in the process. Using Blog Herald as an example, they cover blogging news and tips. In the US, the new FTC guidelines went into effect December 1st. Where were Blog Herald’s articles covering this? One of the reasons why I waited to post this article until today was to see if they would post something on it. They did, a day later. Meanwhile for the past couple of days, bloggers have been going nuts trying to figure out what to do, especially video bloggers. Wouldn’t it have been nice if the Blog Herald (or other blogging blogs) had a series of articles on how to be in compliance, dealing with advertisers, etc? Bloggers would have a solid source of advice and information to prepare them for this change. That’s an example of evolving. Take advantage of upcoming opportunities to inform your current readers while creating new ones. This way your blog can experience a growth spurt without making major changes that might rock the boat. In business, it is wise to be aware of what the competition is doing however, that does not mean if ADC company does something you have to one up them. Let’s look at an example of where evaluating the competition failed. The design community. Most articles published in the community are list articles but there is a more fundamental root issue. I brought up the overuse of list entries quite some time ago. The problem here is that the A-List bloggers in this community said nothing and did nothing to “evolve” past overusing lists. Do you see the problem? By “evaluating”, the competition sites copied each other, no one said anything, and there has been no evolution in the community. It maxed out (or depending on whom you ask, flat lined). In this case evaluating the competition and doing what they were doing was a bad idea. Remember all the Digg clones? Remember their response? Flattered, but they laughed. While the copy cats were copying what they currently knew about, Digg was working on something new. Is Digg as popular as it once was? No. Why? They irritated their audience changing things attempting to thwart the competition. What happens if you copy a site that is destined to a downward trend? What happens if you don’t notice the downward trend in time? Be aware of the competition but do your own thing. Don’t worry about going off the path you set for yourself. Change your style and tone. Take risks and find out what works. Find the balance in these contradictions to be a successful blogger. To me, when the author acknowledged the contradictions, there was a problem. Don’t publish the article. Trying to follow that advice is like trying to solve a riddle. Let me be clear, it is hard to advise people, especially blanket advice, but how is an article that ends saying, “figure it out” helpful? Especially if you look at successful commercial bloggers and notice, they’ve changed very little. Same style of writing, same tone, no new features on the blog and some are very repetitive topic wise with their articles. They might change their site design but that’s about it. Where is the proof that these major changes are needed? I have talked with thousands of bloggers over the years about their blog. Many of them wanted to be “big”, wanted to be an authority in their niche, etc. When talking to them, most did not have an accurate perception on how their blog was received by strangers. Once that topic was tackled, they had no clear picture on what they wanted to achieve (other than being big) and how they were going to get there. Or a realistic idea of how long it would take and if it was truly possible. The one point that was clear: the advice I gave one blogger did not necessarily work with another blogger in the same niche. People evolve to better themselves. They push their limits, try new things, take risks, etc. to explore what life has to offer. That is a personal journey. What a person does and what a company does are two different things. Companies (commercial entities) need stability. However, as the person (blogger) evolves, their change in personality or taste usually shows in their content. Sometimes that means a change in topic, domain name, writing style, etc. 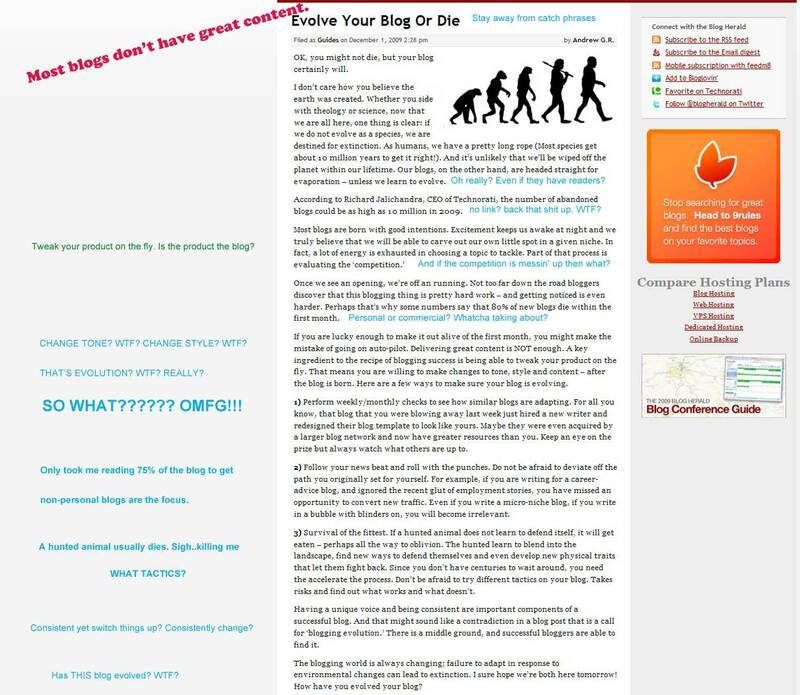 The change was not made to “evolve the blog”. The change was made because the writer changed and the person wanted the blog to reflect those changes. An example, a blogger writing about games has a new addition to their family: a baby girl. Their love for their new child spills over into the blog with baby updates. Perhaps the baby updates mean more than covering games, since the blogger doesn’t have the time anymore to play as in the past. The blogger has a decision to make. Some bloggers would continue to cover games, some would change to a parenting blog. Some would do nothing, keeping the blog a mix and dealing with the consequences of it. There isn’t a right answer without more facts. When I give blogging tips, I give advice that will help the norm. Writing original content, having a solid design (and the aspects that make up a solid design), understanding your target audience, etc. are things everyone can benefit from. However, when you advise people to change their tone and style, take risks (without talking about what types, etc. ), deviate from their path/plan…those are one-on-one consultation discussions. Giving that type of advice without facts on what the blogger is doing and what their plans/goals are usually will not work well. Give advice based on experience.